Music Director Ludovic Morlot conducts Olivier Messiaen’s Trois petites liturgies de la Présence Divine with the Seattle Symphony and Northwest Boychoir on January 5, 7 and 8. The quote above is from the seventh volume of Olivier Messiaen’s Treatise on Rhythm, Color and Ornithology. Messiaen is describing his approach to writing Trois petites liturgies de la Présence Divine. 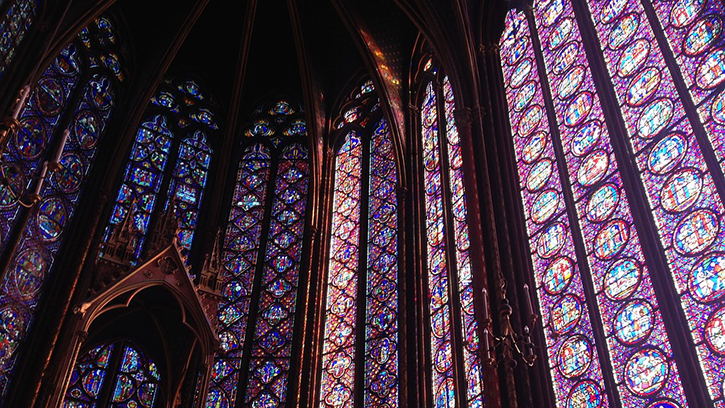 He wanted the listener to get lost in the brilliant colors of the music, not unlike his own experience with synesthesia — Messiaen saw colors whenever he listened to music. The score to his Trois petites liturgies is speckled with color indications that hint at the colors he experienced. Messiaen began working on Trois petites liturgies in 1943 while Paris was occupied by German forces. After Germany invaded France in 1940, Messiaen briefly served in the French armed forces but was captured at Verdun and held as a prisoner of war. During his imprisonment, he composed Quatuor pour la fin du temps ("Quartet for the End of Time"), one of his most famous works. The piece was premiered in the prison camp by Messiaen on piano with his fellow prisoners, a violinist, clarinetist and a cellist. Messiaen started writing Trois petites liturgies in November 1943 and completed the piece in March 1944. The text was written by Messiaen as he composed, often drawing from his favorite sacred texts. The words are set forth by a choir of women’s voices. Accompanying them is an unusual ensemble of percussion, piano, string orchestra, and ondes Martenot, an early electronic instrument that creates an ethereal sound. The composition offers a striking array of tonalities and textures that range from sensuous, rich singing in the choir to rhythmic shouting and percussion. Messiaen uses the piano and vibraphone together in a miniature ensemble that he compares to the Balinese gamelan. The string writing provides a lush, other-worldly atmosphere that envelopes and draws the other elements together. Messiaen called the first movement an “interior conversation” and explained that it is meant to evoke “the God that is present in us.” The opening and close of this movement juxtapose serene melodic lines with birdsongs transmitted primarily by the piano. A contrasting central passage brings a faster pace and greater rhythmic complexity in both the vocal and instrumental parts. A single violin and, later, ondes Martenot, play lines intimating ecstatic dance, while piano, percussion, and the string ensemble each contribute vigorous figures of their own. All these combine with the vocal line to create an exhilarating polyphony of diverse elements. The same notion animates the second movement. But in contrast to the dizzying welter of musical detail this movement presents, its formal structure is a simple rondo design: a brief melodic idea alternating with episodes of more variegated music. The end conveys religious rapture through sheer sonority, bright and overwhelming. The final “liturgy,” like the first, unfolds in a broad A–-B–A pattern, but with tempos and characters reversed: here the outer panels are fast and rhythmic, while the central episode brings slow, sustained music and celestial sonorities. The reprise of the initial section culminates in another of Messiaen’s shattering climaxes, but the composer appends a coda passage that brings the work to a tranquil close. Regrettably, very few conductors and orchestras have recorded Trois petities liturgies to date, but there are two excellent recordings available. Conductor Myung-Whun Chung leads the Orchestre Philharmonique de Radio France in this superb and luminescent recording that includes some of Messiaen’s other orchestral music. If you’re a fan of Leonard Bernstein’s, you will enjoy this live recording featuring the New York Philharmonic. The mastering is not as meticulous as the version by Myung-Whun Chung, but it does speak the immense support that Bernstein provided his contemporaries. Trois petites liturgies de la Présence Divine is rarely performed by orchestras in the United States. Music Director Ludovic Morlot will lead the Seattle Symphony’s first performance of this masterpiece by French composer Olivier Messiaen on January 5, 2017.